It’s confirmed! If a country walks like an Islamic state and talks like an Islamic state, then it must be an Islamic state. The Islamic states regard Israel as their enemy. So does Malaysia, particularly the 7th PM. Sections of the international media have always labelled Mahathir Mohamad as “virulently anti-Semitic” (see tweet below) or “an avowed anti-Semite“. Present: Israel has just condemned, once again, the “rabid anti-Semitism” of our PM. 16 Nov 2018: Australian Treasurer Josh Frydenberg critiqued, “The Malaysian Prime Minister Dr Mahathir has form” – meaning, a consistent pattern of anti-Semitic behaviour, including banning the multiple Oscar-winning Best Picture Schindler’s List from being screened in Malaysia. This was 1994 during the era of Mahathirism 1.0. Early October 2018: In an interview with BBC’s HardTalk, Mahathir described Jews as “hook-nosed” and challenged the figure of ‘six million’ Jews perished during the Holocaust. Mid August 2018: Mahathir defended his right to be anti-Semitic. 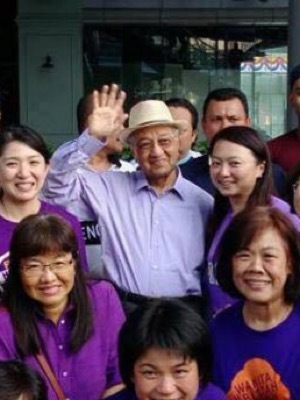 In an exclusive interview with the Associated Press, he had been asked about his long record of anti-Semitic comments – criticisms which he shrugged off with that trademark Mahathir nonchalance. Late June 2016: Mahathir doubled down on his anti-Semitic remarks in an interview with Al-Jazeera’s Mehdi Hasan – see video above. 13 Aug 2012: Writing in his Che Det blog, Mahathir reasserted his ‘favourite Jews rule this world by proxy’ trope. Mahathir’s 2012 ‘Jews rule the world’ polemics had previously gained notoriety in an earlier 2003 cycle. The old man doesn’t change at all, does he? Mahathir’s main theme is that the Jewish diaspora – though comprising only a small minority – are in reality very influential or even in control of their powerful host countries. More evidence that Mahathir is incapable of meaningful change: A few months ago (Oct 2018), the Dapsters’ most “beloved Tun” characterized Jews as “hooked nose”. He had used this very exact “hook nosed” description of Jews in his The Malay Dilemma. Talk about consistency through the span of half a century! Mahathir also wrote in his May 13 opus almost 50 years ago that Jews “understand money instinctively”. His rhetoric about Malaysian Chinese back then was no different from the views he still holds about the Jews. So what do you think are Mahathir’s views about the Chinese and their wealth today? Ada ubah? Among the countries that don’t recognize Israel and have never had diplomatic relations with her are Afghanistan, Algeria, Bangladesh, Brunei, Indonesia, Iraq, Kuwait, Libya, Pakistan, Saudi Arabia, Somalia, Sudan, Syria, UAE and Yemen. The majority of these are Islamic states. 0n 17 June 2002, Mahathir announced Malaysia as “an Islamic fundamentalist state”, and proud of it. The then 4th PM (Mathirism 1.0) declared our country’s Islamic status when he spoke in parliament. Lim Kit Siang at that time labelled it Mahathir’s ‘617 Announcement’. A few months prior, in what Kit Siang called Mahathir’s ‘929 Declaration’, the 4th PM had similarly declared Malaysia as an Islamic state when making his speech at the Gerakan AGM on 29 Sept 2001. For decades, Kit Siang had spit at MCA and the other Chinese-dominated BN parties – see tweet above – for not ever daring to contradict Mahathir’s 2001 / 2002 declaration of Malaysia as an Islamic state. But today, DAP Yang Berhormats are Mahathir’s biggest bootlickers and water carriers. Kit Siang has been obsessed with going around asking every political figure (who wishes to ‘cleanse’ himself) to repudiate the BN’s past misdeeds. Fact is, the ex-BN head honcho (1981-2003) is currently the chairman of DAP brainchild Harapan. Will Kit Siang now ask his own ruling coalition chairman to repudiate those “most shocking” (Kit Siang’s words) ‘617’ and ‘929’ Islamic state proclamations? I think not. What’s your problem then? Can’t accept the fact that this country you called home now, have in centuries been a Muslim country, ruled by the Malay sultanates. Better sink that into your thick skull. If you don’t like it here, please understand that pendatangs like you were and are not needed here in Malaysia. It’s the British pandai2 bawak the Chinese and Indians into this country. Empayar melaka was well developed by the Malays before the penjajah ruined everything. Another racist piece of shite. Considering us nons control the economy, you better hope that we stay on. The country will collapse without us. Now get that through your thick skull.